Whilst we always knew that eventually we would lose, yesterday's defeat was an unmitigated disaster. Not only does it mean that 3rd placed bath move to within 4 points of us, when the reverse result would have increased it to 10 points, but on a weekend when our closest rivals dropped points, they still moved closer by a point, whilst maintaining the 2 games in hand on us. Both Bath and Woking will see us as catchable now. Yesterday could prove very costly indeed. Suggest we try to get Matt Rhead on loan from Lincoln. He would be too much for defenders at this level...big,strong and good in the air. Just what we need. Not sure Rhead would want to play at this level seeing he still features in the first team. That seems a bit random, Stig. Not sure why you would think a player at a club vying for L1 status would want to join a club that will still be playing non-league footie next season, even if we do get promoted. Best video coverage I've seen for a long while and it captured the occasion and atmosphere very well. Bath were pretty good for long periods and closed us down quickly where we like to play and create. They did there homework on us that's for sure. Should have at least gained a point though ..
Like to think there will be a reaction on Saturday and we get back to earning the right to play our pressing high tempo game. Oxford City were up there a few weeks a go. Undefeated in December with five wins and a draw, but are currently on an run of three straight defeats. A bit random indeed...and a long shot. However Rhead not getting much playing time at Lincoln City and they have just added to the squad. If you are going to dream.. might as well dream big. 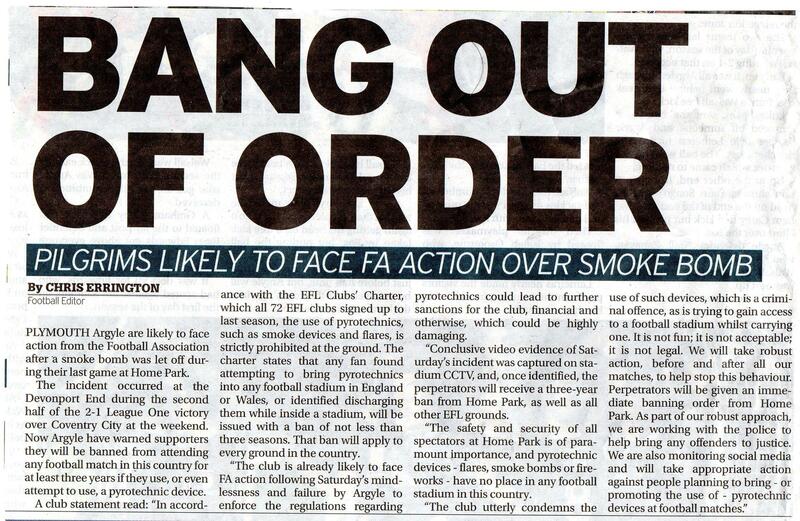 link - number of banning orders have been handed out to those behind the disruptions for this match and I am very pleased that this robust action has been taken. Well done to the football club. The Neanderthals who advocate the sort of behavior are thankfully being put in their place. The sight of supporters, some of them middle aged men who should know better behaving like they did was sad indeed. Glad to see the club has responded and hopefully nipped this stupidity in the bud before it got out of hand. If this was allowed to continue it would no doubt escalate into more smoke bombs and more ridiculous juvenile ape like provocation of away supporters.